Renowned as the Julia Child of Mexican cooking and author of the definitive books on the subject, including The Cuisines of Mexico , The Art of Mexican Cooking , My Mexico , and From My Mexican Kitchen , Diana Kennedy has now written her magnum opus—an irreplaceable record of the traditional regional cuisines of Oaxaca. No one has done more to introduce the world to the authentic, flavorful cuisines of Mexico than Diana Kennedy. Acclaimed as the Julia Child of Mexican cooking, Kennedy has been an intrepid, indefatigable student of Mexican foodways for more than fifty years and has published several classic books on the subject, including The Cuisines of Mexico (now available in The Essential Cuisines of Mexico , a compilation of her first three books), The Art of Mexican Cooking , My Mexico , and From My Mexican Kitchen . Her uncompromising insistence on using the proper local ingredients and preparation techniques has taught generations of cooks how to prepare—and savor—the delicious, subtle, and varied tastes of Mexico. In Oaxaca al Gusto , Kennedy takes us on an amazing journey into one of the most outstanding and colorful cuisines in the world. The state of Oaxaca is one of the most diverse in Mexico, with many different cultural and linguistic groups, often living in areas difficult to access. 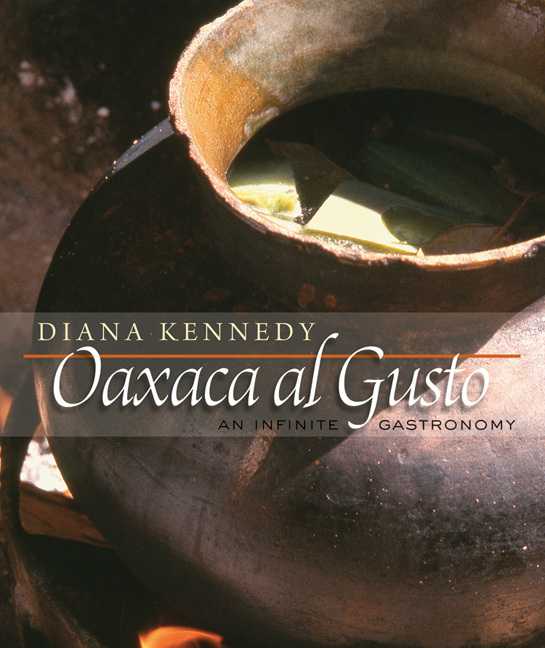 Each group has its own distinctive cuisine, and Diana Kennedy has spent many years traveling the length and breadth of Oaxaca to record in words and photographs "these little-known foods, both wild and cultivated, the way they were prepared, and the part they play in the daily or festive life of the communities I visited." Oaxaca al Gusto is the fruit of these labors—and the culmination of Diana Kennedy's life's work. Organized by regions, Oaxaca al Gusto presents some three hundred recipes—most from home cooks—for traditional Oaxacan dishes. Kennedy accompanies each recipe with fascinating notes about the ingredients, cooking techniques, and the food's place in family and communal life. Lovely color photographs illustrate the food and its preparation. A special feature of the book is a chapter devoted to the three pillars of the Oaxacan regional cuisines—chocolate, corn, and chiles. Notes to the cook, a glossary, a bibliography, and an index complete the volume. Awarded 2011 Cookbook of the Year by the James Beard Foundation. A British citizen, Diana Southwood went to Mexico in 1957 to marry Paul P. Kennedy of the New York Times . Today she is widely considered the foremost researcher, teacher, and writer on the regional foods of Mexico and has written eight books on the subject. She has been bestowed the highest honor given to foreigners by the Mexican government, the Order of the Aztec Eagle, for her work of disseminating Mexican culture through its foods. She has also received numerous awards from other gastronomic institutions and was decorated with an MBE by Queen Elizabeth for her work in strengthening cultural relations between Mexico and the United Kingdom, as well as for her work for the environment, which is always reflected in her texts. For the past thirty years, her studies have been centered around her ecological house in the state of Michoacán. It was about 1994 that I was first asked to write a book for the governor of Oaxaca on the traditional foods of that state, but for various reasons, politics among them, the project was never realized. Two more frustrating attempts were abandoned, and it did not get written until about 2003, when I received a definite commitment from a Mexican publisher for a joint project with a U.S. publisher. However, when it was apparent that the style and content of the book were being severely compromised, I broke off negotiations and retrieved my material. Another prolonged delay ensued before I was able to find a publisher that was willing to include the text and recipes from the indigenous areas and not just the more familiar material illustrated with the usual predictably glamorous photographs. Trying to record the ethnic foods as well as the more sophisticated recipes from the urban centers presented an enormous challenge and responsibility. Oaxaca is the most mountainous and diverse state of Mexico, with many different cultural and linguistic groups, often living in areas difficult to access, and with an incredible biodiversity. Like many authors before me, I am sure that if I had known what it would entail to travel almost constantly through the year, and often uncomfortably, to research, record, photograph, and then cook and eat over three hundred recipes, I might never have had the courage to start the project in the first place. I am not an academic, historian, anthropologist, or botanist, but just an adventurous cook and a lover of the natural world who delights in the experience of traveling to discover and taste foods, some of which I had only heard about, but many that I was yet to discover in this infinite world of Oaxacan gastronomy. It was an enormous challenge to try to record in words and images these little-known foods, both wild and cultivated, the way they were prepared, and the part they play in the daily or festive life of the communities I visited. Of course, it would take various volumes and many years to do full justice to this fascinating subject, as well as contributions from anthropologists, archaeologists, botanists, and linguists (a pity that local gastronomy does not play a part in their professional training). Nevertheless, in these pages I have attempted to relate something of what I found in my many years of wandering throughout the state of Oaxaca. I realize that there are notable omissions of the specific foods of the Mixe, Zoque, and Amuzgo areas, for example. I only hope that the many wonderful cooks whose recipes I have not been able to include will forgive me. They may not agree with my choices (there are always disagreements and rivalries among cooks about ingredients, quantities, and methods), but I have tried to include the most representative recipes for the foods that I have eaten and cooked in Oaxaca since my first visit there in 1965. Those who do not know Oaxaca outside the popular tourist areas may perhaps get a broader view of the enormous gastronomic wealth that plays a part in the daily, religious, and festive life of Oaxacans of different cultures and economic levels. Apart from all the intense work and difficult travel over many years, I have been immensely enriched, not only by discovering the incredible natural beauty of the countryside but by getting to know Oaxacans from all walks of life. Even the most humble have invited me into their kitchens to share and demonstrate their culinary knowledge; they have fed me and given me shelter without a question asked and with a generosity and caring without limits. They are the soul of this book. This book evolved over many years of research traveling to the remote corners of the state of Oaxaca. Since there are pronounced contrasts, both cultural and physical, between the eleven areas into which the book is divided, I decided not to organize the book in conventional chapters—appetizers, soups, main courses, etc.—but to give each area its unique identity and place by first showing the landscapes that identify each geographical area, with the one notable exception of the coast. A special chapter is devoted to three ingredients that are, without doubt, the mainstays of the Oaxacan regional cuisines: chocolate, corn, and chiles. Chocolate's importance is not because the state is a large producer of cacao—indeed the cacao of Chiapas is preferred—but because of the fascinating ways in which it is prepared. Chocolate is not only a comforting drink but plays an important part in social and religious customs, particularly expressed in the espumas, or foams, either served alone, as in tejate, or as a frothy topping for atoles. Fray Eugenio Torres Torres, an eminent historian of the Dominican Order in Mexico and Latin America, has given us a glimpse of how chocolate has played its part in the conventual history of Oaxaca. Oaxaca is the birthplace of corn, and not only are the number and variety of races superior to those of any other region of Mexico but, not surprisingly, so also is the number of different ways in which it is prepared, as demonstrated in the following pages. Who better than Amado Leyva to write about corn? An agricultural engineer, he has devoted his recent years to the conservation of the endemic varieties of corn (maize) by sponsoring and encouraging their cultivation, finding markets for their harvests, and demonstrating their individual uses for tortillas, antojitos, tamales, and atoles. The local chiles, which I myself have collected and cooked with over many years throughout all the regions of Oaxaca, are unique to each particular area and are, with minor exceptions, cultivated nowhere else. They lend their characteristics to the moles and sauces that define Oaxacan cuisine as one of the most outstanding and colorful in the world. The photographs, many taken by me in situ, do not necessarily illustrate the adjacent recipe but are included to show the multiple ingredients and local cooking methods, respecting the components of each of the indigenous cuisines, many of which are unknown outside their own areas. Except in the cases of a few well-known general recipes, the persons who shared their culinary wisdom with me are named at the head of each recipe. The following pages offer a unique journey across this diverse and alluring state to discover, as its subtitle proposes, the "infinite world" of the traditional regional cuisines of Oaxaca. Prepare yourself to savor this fascinating journey. In the Mixteca Baja, this way of cooking beans calls for frijoles bayos or colorados grown in the area and not the ubiquitous black beans used in many parts of Oaxaca. Pinto beans can be used as a substitute. Locally, this dish is served as a main course with white rice or to accompany a carne asada. Put the beans into a large pot, cover well with water, add salt to taste, and cook over medium heat until soft, about 2 hours, depending on age of beans. They should be rather soupy. Put the water into the blender jar; add the chiles, garlic, cumin, and oregano and blend until smooth. Heat the lard in another pan and fry the chile mixture over high heat until reduced and seasoned, about 3 minutes. Add to the beans and their broth, mashing the beans down a little to absorb the seasoning, about 10 minutes over medium heat. Add the yerbasanta leaves in small pieces and continue cooking for 3 minutes more. Serve in soup bowls.